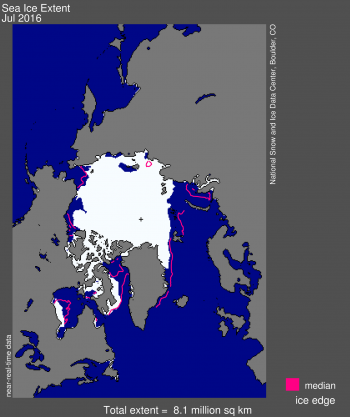 NSIDC on Arctic Sea Ice: 'A new record low September ice extent now appears to be unlikely." | Watts Up With That? From the National Snow and Ice Data Center. 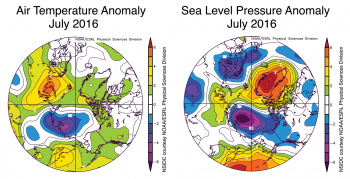 Beginning in June there was a significant change in the atmospheric circulation over the Arctic. May was characterized by high pressure over the Arctic Ocean which had persisted since the beginning of the year. 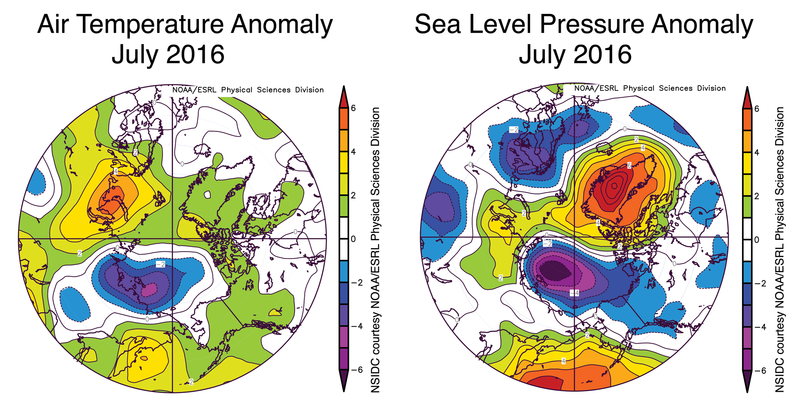 However, in June the pattern shifted to lower than average pressure. This brought clouds and fairly low temperatures to the region, slowing ice loss. The change in circulation also shifted the pattern of ice motion, slowing the earlier movement of ice away from the coast in the Beaufort Sea (as depicted in ourMay 3rd post). Anyone might think that the scale for fig3 had been chosen to create the impression that the ice was about to disappear. Mathematically, Fig 3 is almost certainly the equivalent of the first pi radians of a cosine function. Zero year is the 79-80 winter, where it was maximal in the satellite record.22-26 years from now, the Alarmists will be back on the global cooling scare bandwagon, ala 1975-76. Yup, the AMO does do that, doesn’t it. The northeast passage was open from the late 1930s into the 1940s. The northwest passage was also navigated in the same period. The northwest passage seems to be a bit less sensitive to the AMO however. Mathematically, Fig three almost certainly looks like diddley squat, and the blue line on top of it is not a good fit, and doesn’t come close to matching the up and down movements of the real thing. A typical case of throwing away real information and replacing it with total fiction. 1979 / Nimbus-7 is a convenient starting year for sea ice alarmism, as illustrated in the IPCC’s First Assessment Report (“FAR”). There’s no graph like that to be found in the TAR, AR4, or AR5. Striking polar see-saw effect at 1976. Yes, indeed, it’s a very beautiful cosine function. with a little mixture of log, and a pinch of arctangent. or maybe it just goes down. PS : your red circles are very nice. Very beautiful. For the uninformed, it is absolutely essential to have periods of sea ice that are slightly lower than average. This comes about because there are also periods of sea ice slightly above average, and if that wasn’t counterbalanced by the lows, that would result in a shift of the average. It doesn’t really matter if the average shifts since we never observe that happening anyway. Not only that. See ice cover is 50% of the time below average. I remember president Reagan was rather upset when told that 50% of Americans were of average intelligence or lower. I suspect he belonged to that group as well. Even Fig 2a uses a scale that should have zero as the origin. There is no excuse for such unscientific behaviour. It has AMO written all over it. Oh dear. Sad news for the Alarmists. Oh well, maybe they’ll get lucky and a really big hurricane will hit the US mainland. Not really. The people they most want to influence live in areas that are right now suffering through one heck of a heat wave. The vast majority of those people will never be informed that there are other areas of the world where the temperature is below normal. They are too hot, so the world is too hot. I’m sure there will be news articles all over the world retracting the earlier predictions of new record lows. /sarc. I propose a moratorium on all predictions of this type, including this present one.. I really feel for the poor souls who love Arctic sea ice so much that they want it to disappear. Maybe the disease of Climate Change Personality Disorder should enter the psychiatric literature. What about the poor souls (idiots) like me who live in northern climates and want to see the ice increase just to prove the experts wrong? Do we get our own disorder? No you’re OK. You’re used to it and will probably enjoy the extra cross country skiing and ice fishing. Saying they “want it to disappear” is a gross corruption of what they really think. It says much more about those who dispute their evidence. Ha ha, tony mcleod resembles that remark !! Amongst the Warmistas and Alarmists, there is much wailing and gnashing of teeth and prayers for a hot autumn and winter. We have to have periods of above average Temps, to balance those times where we have below average temps. You can’t have one without the other, and they don’t seem to realize that. Nobody know when the temperature is average any how. When was the last time you remember the temperature having its average value ?? The period from 1940 to 1974 saw global temperature declines and increased ice. 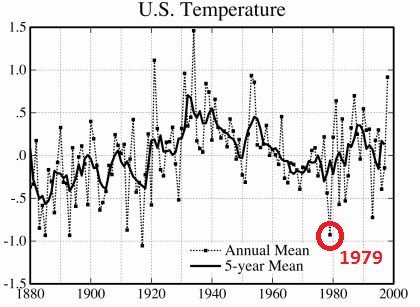 From 1974 to 2003 was conveniently a warming period for Al Gore and the ice decline. Since 2003, global temperatures have been flat and are starting to decline again. If the ice extent chart here were segmented at 2003, the two lines would be consistent with the temperature charts, and extrapolation into the future would not erroneously predict further declines, as this chart regression line does. Instead, it would predict some increase in sea Ice as is happening, especially as the El Niño hot water bubble in thevGulf of Alaska we saw form last year has disappeared. Dramatically increased ice will be undeniable by 2020. See Paullitely.com. Personally, I think the only reason the temps have been flat since 2003, is because of coordinated weather services attempts to goose up the numbers to make it look like the temps aren’t declining. That chart shows the bogus high 2016 values, that were due to satelite sensor failure. Please find a better one. I understand that. Still the trend prior to the sat failure makes the point I wanted to show. Griff, put a plot of the number of icebreakers operating in the Arctic ocean against the one from nsidc. In any other ‘pristine’ ecology greens would be protesting vehemently against the destruction of the environment. But when it is icebreakers breaking up the ice so the greens have their cause celebre supported, they are somehow silent. It’s nonsense, British Naval reports pre 1900 talk of 2000 leagues of open sea where there was ice before, many reports of the arctic passage being open in late 1800s and early 1900s. Ian the NSIDC tell us icebreakers are not a factor. They should know -they’ve been studying the ice since 1957. Mark – you can follow the link and get the data. Really if you examine all the records, we’re lower than at any time since 1850.
all the records were consulted -all the Danish records from their institute going back into the 19th century, the whaling records, etc. we’re lower than at any time since 1850. You need to remember that an unusual invasion of low pressure into the Arctic helped break up the floating ice in 2012, substantially contributing to the record September open Arctic of that year. Add to this the Greenland “ice melt” of July 12, 2012 and the incursion of that very warm air into the Arctic zone, and the meteorology was set up for the 40% open Arctic of that year. No such luck this year. The flattened Jet Stream kept warm air to the south of Greenland. Countering this, warm ocean currents flowing through the gap between Spitzbergen, Bear Island, and Norway still contributed to what may become the second greatest September open Arctic. Each year is different; this year is no exception. The differences are fascinating!!! So what? We’ve had less ice in the past and no doubt we’ll have less ice at some point in the future.You have no proof that isn’t just natural cycles. Get over it Griff, the general public couldn’t care less. Joe Bastardi also has some notable observations on this year’s Arctic ice record in his Saturday summary at Weatherbell analytics. Worth a watch. That’s Joe Bastardi whose arctic sea ice predictions have twice now failed to come about? Shall we stack up the failed ice claims and see where the balance is lol. The m0r0n5 will be off again, 12 months of “no ice in the arctic in 2017”. 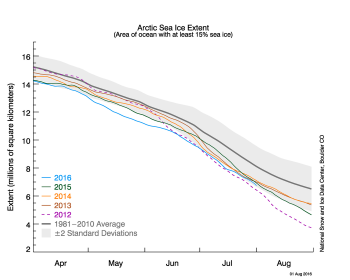 What about Wadham’s hopeless “no ice next year” predictions? Frequently misquoted though he is, Wadhams has been studying the ice in detail for a long time and he is sadly going to be proved right about it going before the decade is out. Chaos precludes prophecies and predictions. They should stick to forecasting inside limited frames of reference (i.e. scientific domain). Science does not entertain professional oracles. We have a variety of ” Laws ” in Science, specially in Physics, and maybe chemistry too. These laws usually tell us what the likely result of an experiment will be relating to those laws. The thing that characterizes these laws of science, is that our tolerance for discrepancies between what we observe and measure, quite often with exquisite accuracy, and what those laws say, is extremely limited to a small space around zero. In fact any repeatable demonstration of a consistent difference between what we observe and our laws relating to that phenomenon, is grounds for scrapping the law, or at least modifying it in such a way that the discrepancies are resolved. Compare this approach with what happens in climate science, where people make up laws based on statistical prestidigitation performed on presumably observed climate observations. This amounts to little more than curve fitting, and the discrepancies between such laws, and the observations, is laughable. And as often as not the process of eliminating the discrepancies, amounts to simply doctoring what was previously reported as actual measured observational data. And somehow, this still passes in some minds, as Science. Arctic Ice Extents follow PDO and AMO 30-yr warm/cool cycles; especially AMO cycles. The PDO has already entered its 30-yr cool cycle and the AMO enters its 30-yr cool cycle from around 2020. La Niña conditions will substantially increase Arctic Ice Extents for the next two years, and the closer the AMO comes to entering its 30-yr cool cycle, the more Artic Ice extents will recover. “The Blob” also contributed to Arctic Ice Loss over the last 2 years, and still has not disappeared entirely. When Arctic Ice Extents start to show obvious increasing trends, it’ll be yet another CAGW projection that has failed miserably. I thought that by now there was not supposed to be any ice, or snow either? Nah, they already have a backup for the next ice age (falling temps) as also being caused by CO2. So they’ll just switch to that meme to keep the public money rolling in. Oooo. I’m terrified. Especially since the increasing Antarctic sea ice is caused by global warming, just as is the warming west Antarctic peninsula, and the cooling remainder of Antarctica, record cold winter in New Zealand, the hot summer in North America, the drought in the American west, the floods in the southeast, the normal tornado amount, the Atlantic hurricane drought, the super typhoons in the pacific, and, of course, is certainly the cause of Donald Trump being a presidential candidate…. Antarctic sea ice fell back to the norm almost one year ago, and has stayed at the average trend line since then. I can’t help but wonder if the main reason for the record low months for much of this year had to do with the satellite going on the blink. Here in Northern California temps have certainly gone into a cooler than the normal mode after the very short heat wave from several weeks ago. Last night temps went down to 52F, which is great except for setting the tomatoes back a bit. What a difference between this summer and the last 5 summers. … several polynyas beginning to form late in the month. I always thought a polynya was a persistent hole in the ice, not just a hole that pops into existence during the melt season. Polynya, also spelled polynia, a semipermanent area of open water in sea ice. Polynyas are generally believed to be of two types. Coastal polynyas characteristically lie just beyond landfast ice, i.e., ice that is anchored to the coast and stays in place throughout the winter. They are thought to be caused chiefly by persistent local offshore winds, such as the foehn, or katabatic (downward-driving), winds typically found off the coasts of Greenland and Antarctica. Open-ocean polynyas, the larger and longer-lasting of the two types, form within the ice cover and are believed to be caused by the upwelling of deep warmer water. This type is best exemplified by the vast Weddell Polynya in the antarctic Weddell Sea. Right. So how can they talk about polynyas developing? Don’t they have to wait long enough to make sure they aren’t just temporary before they can call them that? I don’t think there is any time limit involved. If the wind blows off shore, and moves the sea-ice away from shore, it is a polynya even if it lasts five minutes. The thing to keep in mind is that the open water is not due to ice melting. It is due to ice moving. So will the cruise ship transit the North West passage? It does have an ice breaker tagging along, analogous to have fossil fueled generators backing up bird slicers and roasters. They are very worried atm that they wont get out of there. They also seemed amazed (on their blog) that polar bears are good swimmers, given polar bears spend most of their life sleeping or swimming, hardly surprising. Should be circum-polar of course, damn spell checker! “Record low?” I thought it was all gone by now. Remember, the only signal that matters is the current one that is “catastrophic”. Alarmists jump to the next one like fleas in a dog pack. If the minor (not the major mind you) sucking singing siphoned simple (not the complex kind) salamander were in some kind of trouble, THAT would be the current canary in the goldmine, got it? I love me some alliteration. Is the Polar Ocean Challenge still stuck in Murmansk with all its alarmist passengers, unable to proceed due to ice blocking the way? Anchored in a cove on an island near the ice choked Vitilsky Strait. Unable to proceed yet into the Laptev Sea. And running out of vodka. They now appear to be stuck in the Nordenshel’da Archipelago just at the start of the Vilkitsky strait. In more somber news, they are almost out of wine and vodka. The suffering! But I’m sure George is right. They will get supplies via air drop. Russia always treats valued guests generously. But the poly bars appreciate fine cuisine delivery. Because that is recovering nicely. click on date and animate to compare. Griff: extent and ice volume are two different metrics. In general, since the satellite records began in fall 1979, the much-repeated “arctic death spiral” of warmer arctic air temperatures melting sea ice, which abosrbs more sunlight (energy) which heats up the arctic ocean and melts more sea ice …. Simply put, this theory can be easily stated, but it just has not happened in the real world. 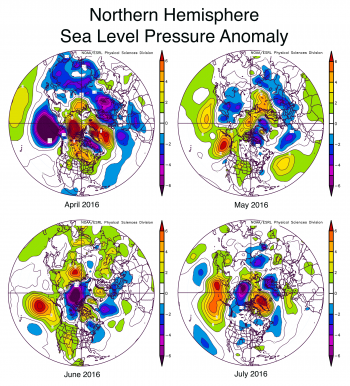 Not happened from season to season – though yearly maximum, average and minimum levels have decreased in an apparently almost-sinusoid-type cyclical pattern. Not happened spring-to-fall, not fall-to-spring. Instead, the opposite has happened. A very high spring sea ice extents (high anomaly compared to the average) is usually followed by a very low fall sea ice extents. (Spring 2012 was at a satellite record high extents! 2007 arctic sea ice extents was also high compared to the 5 years around it, to cite the two record LOW fall sea ice extents. Then, June-July, it was remarkably low. Now, the “experts” are claiming the Sept minimum will be again back near average deviations from the established normals. A good test of the importance of Arctic sea ice is the following. The entire area of Greenland is 2.06 million square kilometers, almost all of it covered in light-reflecting ice and snow. The less reflective (much darker) sea ice and melt water ponds of the Arctic sea ice lies much further north (less sunlight per square meter of flat surface, lower sunlight angles and more atmospheric absorption, more days of complete darkness) lies between 70-71 north latitude (at maximum sea ice extents) and 80-81 north latitude at minimum sea ice extents. Compare, for example, the latitudes shown at maximum, and at minimum for two years. Now, several times in the satellite era of actual recorded sea ice extents, the arctic sea ice anomaly has jumped – both jump up and jumped down – several times by more than 2.5 Mkm^2 of sea ice, more frequently by 1.0 Mkm^2, 1.2 Mkm^2, and even more than 1.5 Mkm^2 of sea ice in a very short (4-8 month) period. And there was NEVER any consistent response to those jumps – neither positive NOR negative! – in the following 6 months, 9 months, or 12 months after a loss (or gain!) of sea ice of more than the entire area of Greenland. If a gains in arctic sea ice in vvery short period is supposed to reflect more solar energy and thereby prevent heating of the arctic ocean, then a gain of millions of sea ice extents in 4 months “should show” even cooler waters, and even more sea ice gain, right? If a loss of sea ice is supposed to heat up the newly exposed arctic ocean waters, then a loss of 2 Mkm^2 square kilometers should be followed by an even larger loss the next melt season, right? It doesn’t happen. Sea ice extent anomalies regain their previous high! Now, if an area about the size of Greenland can frequently vanish (or reappear!) that quickly and NOT have any consistent effect on the sea ice the following part of the next year, then either Greenland has no effect on the Arctic ocean’s heat balance, or the arctic sea ice has no real effect on the arctic ocean’s heat balance. Or both. The simplified theory of arctic sea ice heat absorption and sea ice extents sounds good. It just does not appear to actually work in the real arctic world. in my opinion, and based on my calculations of sea ice albedo over the full year, the solar elevation angle of the sun over the year, and the location of the arctic and antarctic sea ice over the year, the reason the “experts” are failing is that they persist in only using simplified “average” values for all of the above that ARE ONLY VALID below 60 latitude. And there is only year-round sea ice at 60 degrees latitude is around the Antarctic continent. Because we are still seeing frozen in time vegetation being uncovered by ice sheets in Greenland, we may not be at the end of ice melt. 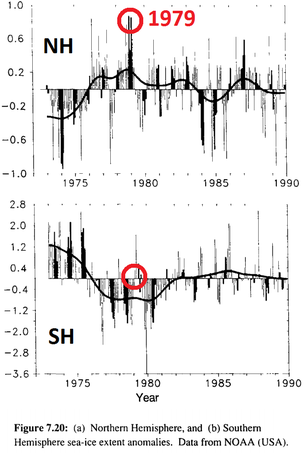 On the other hand, is this the signal, this little sudden plunge in anomaly (or one of the signals) during the interstadial warm period that flags an impending jagged downward slide to a glacial period? As if to signal the last burst of warm sea surface temperature that has migrated to the polar steam vent before the ocean switches to net recharge mode? So what is causing the dang thing to shrink? Equatorial warmed water finally migrating, as it should, to the polar regions where it loses heat to the atmosphere. Atmospheric teleconnections that work in concert to melt ice. If we didn’t have these vents, we would fry, and if we didn’t have solar heating at the equator with currents that transport that heat to the polar region, we would be a showball. Many, especially extreme warmistas, miss the fact that there is a serious ice pile up along the northern shores of Greenland and Canada. It’s subduction and obduction of ice, creating a multi-layered structure that is exceedingly thick. That volume is like the ice boxes of yore. I actually worry about it, vis a vis factors that will ultimately end the interglacial. Even that piled-up ice is in motion, and spreads like butter over bread along the coasts, and a lot escapes through Fram Strait down the east coast of Greenland, a little through Nares Strait down the west coast of Greenland, and the rest moves east in the Beaufort Gyre and either gets used up cooling Pacific water entering via Bering Strait, or continues on to the coast of Siberia and then crosses the Pole a second time, and smashes up against Greenland and Canada yet again. Few people understand how mobile the sea-ice really is. It is an ocean, not a frozen lake. On a day too hot to work, watch the time-lapse movie of O-buoy 9’s voyage from the Siberian side, across the Pole, up against Greenland (with the distant mountains visible), and then down through Fram Strait. It will change your ideas about how open “open water” is, and how amazingly mobile the geology of ice actually is. See on the sea ice anomaly chart how the March maximum extent relatively increases from 2008-2013 following the reduced September minimum’s of 2007-2012. That is a negative feedback in action. ….several times in the satellite era of actual recorded sea ice extents, the arctic sea ice anomaly has jumped.. They lost a satellite around the end of March so most of those charts aren’t accurate any more. When is the cryosphere today expected to be up ? That’s been explained a number of times here. A satellite failed. It is clearly obvious from the graphs exactly when that happened. This issue has been dealt with on WUWT, it is a DMSP satellite failure. Neither of those graphs are accurate anymore. Well, the Cryosphere sea ice reports from the University of Illinois, which used to be useable and functional, started having problems (overnight jumps of millions of sq kilometers – in April this year, and they stalled out and have not changed since May 5. NO useful data is comping from them at all recently, but I’m sure they have not refudned any of that budget they still receive. Blah. So, why are these charts still being posted every day? Did someone just turn on the Cryosphere autopilot in April, and walk away? Posting an explanation in place of a totally erroneous chart would be a lot more professional than ‘updating’ and posting these bogus charts every day. Calculations based on the F18 satellite show an current area of ~3.6 million sq km. Do you just like to argue by ignoring the key words? not sure if we can continue to compare dmi images from years past andy. they now have a new operational “product” for extent graphs that uses a different algorithm . apparently only small differences with previous method ,would like to see them shown in comparison graphs to see how small though. not sure if this affects the volume charts . personally i believe the volume “models” of all the agencies producing them are complete junk. they certainly do not show any of the 10m to 50m thick ice that can be seen in any number of photographs taken on various arctic voyages. having said all that, as bill illis notes below,the ice is more broken up this summer than the previous two. I see a lot more red and yellow, so that means the ice is getting hotter, doesn’t it? Thing is that biodata from places like Fram Straits shows that for much of the first 3/4 of the Holocene the Arctic was often pretty close to ice free in summer. If we also look at the Iceland sea ice index we can see that the 1970’s was actually a time of EXTREME sea ice levels, nearly as high as those coming out of the Little ice age in the late 1800’s. So the small drop since 1979 is actually a RECOVERY from a period of EXTREME sea ice cover, back partly toward the Holocene norm..
Griff, you are embarrassing yourself. 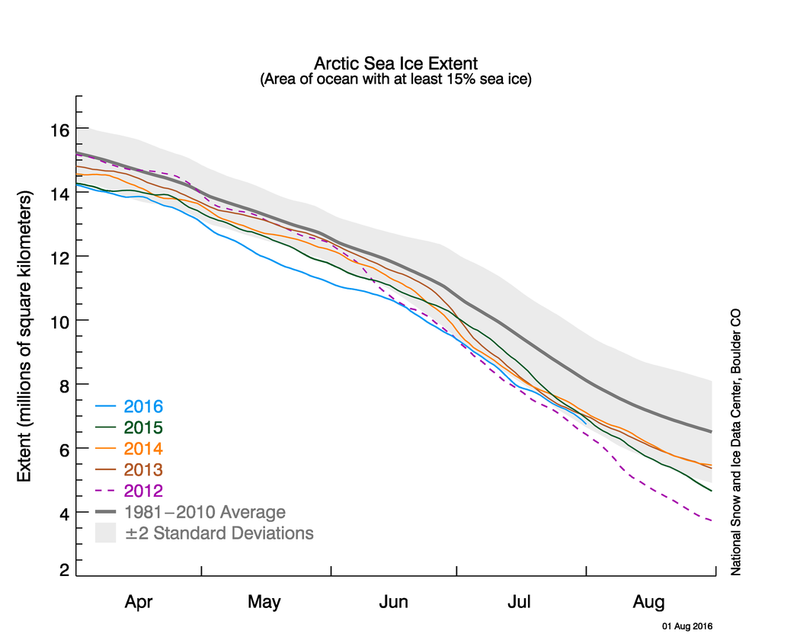 There’s objective evidence of a continued sea ice decline, lowest for over 150 years… the ice is not in a good state. I wonder why you are sniping at me rather than offering evidence? Are you telling me we have recovered to pre-2007 ice levels? So the vikings may resettle green land. Ship the cattle on ferries and weekends flights home. I see this viewing of things as if the people involved are children playing a game where they look at the world through the cardboard core of a toilet roll. Imagine a group of stone age hunter gatherers who finally arrive at the coast of a continent to see the new wonder of their world, the sea. How long before the shamans and tribal ‘elders’ latch on to the rising tide to leverage it to impending doom if certain sacrificial acts are not performed to assuage the anger of the spirits? How long before those ‘sacrifices’ give the elder-shaman elite even more power and influence as the controllers of the tidal spirits? Correct. It’s all esoterica. Without Fig2a or the like, NO ONE would even know there was a difference in sea ice extent year to year. It effects NO ONE. It’s like a weather report for Mars. Looking at the satellite pics through Modis and Worldview, I don’t think the ice looks too healthy right now. It is broken up and there are lots of open areas. But if one views the ice export out of the Fram Strait this year, it is far, far lower than normal which means more of the sea ice stays in the basin where it is less likely to melt and turns into multi-year ice after the winter. Try looking at this Bill and you’ll see you are right – the ice is far from healthy. Record July cold from Greenland. Early winter? A Limerick. “This is the lowest temperature for July we have from this station,” said DMI senior climatologist John Cappelen. Nature has dealt it a mean hand. best as it ever was. +10, for Talking Heads ref. In 10 minutes I will be older than I’ve ever been before. But I’m gaining mass, so it’s not a problem. . Does it matter that much since it doesn’t support the AGW conjecture anyway since as AndyG55 stated,it has had little to no summer ice in the Arctic for periods of time in the early part of the Holocene,despite the CO2 being around 260-280 level. The observed decline of the Arctic’s summer sea ice extent and thickness [Meier et al., 2014], longer melt seasons in the CAA [Howell et al., 2009], and future climate model projections have led to suggestions of a more navigable NWP by midcentury [Sou and Flato, 2009; Smith and Stephenson, 2013]. Caution should be taken with these suggestions because global climate models with their coarse resolution likely have difficulty capturing intricate sea ice dynamic processes within the narrow channels of the CAA. Specifically, the import, survival, and thickness of MYI are difficult to predict and may in fact increase during the transition to a sea ice-free Arctic with more mobile ice conditions in the QEI which are located between the Arctic Ocean and NWP [Melling, 2002; Howell et al., 2013]. Presumably, MYI from the Arctic Ocean will be more heavily ridged and thicker [Melling, 2002; Haas et al., 2010] than locally formed MYI, posing greater danger to transiting ships than locally grown MYI. 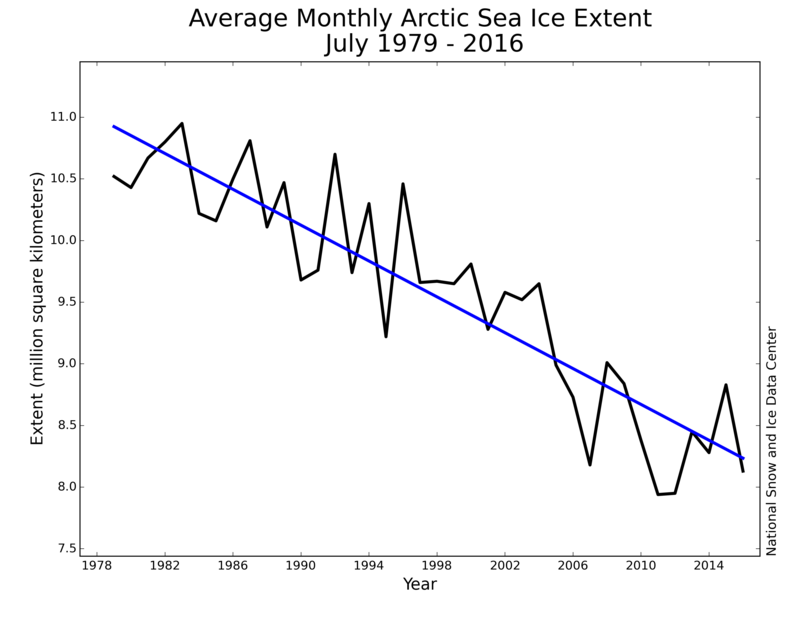 “Can the Arctic really become sea ice-free during summer? It has been suggested that the Arctic really can’t lose all its sea ice during summer because there isn’t enough energy to melt all of the ice in the short summer. There are a couple of reasons why this thinking is faulty. The entire question is nonsense when at realistically. The arctic sea ice reaches a maximum in late March – NOT the middle of winter up north! – when the arctic sun is present about half the time, and when it is dark about half the time. Thus, when it is -25- to -28 degrees C out there and completely dark for 24 hours of every day, the sea ice is still freezing up, gaining area and mass. 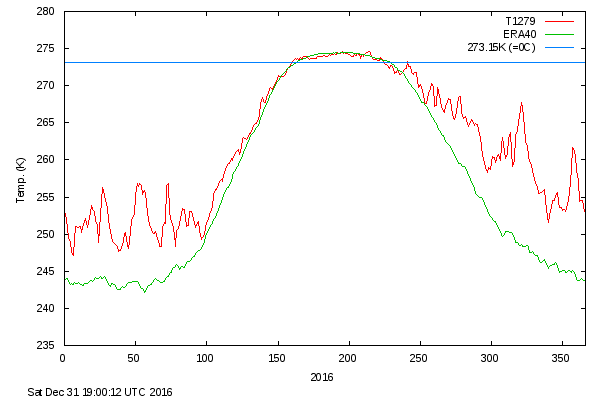 Now, by August 12, the arctic sea ice melt ponds are receiving so little sunlight and so little heat that they begin re-freezing over each night. 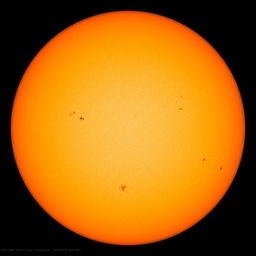 The total solar energy into the melt pond water (into the Arctic Ocean if the sea ice is melting at all) over an entire 24 hour day of 24 hours of sun is so little that the ice begins re-freezing on August 12. Obviously, you are SUPPOSED to amuse that the “complete loss of sea ice” means that the arctic sea ice vanished in March and stayed away all “summer” only to begin refreezing during the darkness of “winter between September and March. Now, there is STILL a large amount of sea ice loss between August 12 and the sea ice minimum in middle September. But does it matter – as Anthony asked the same question so effectively last September? 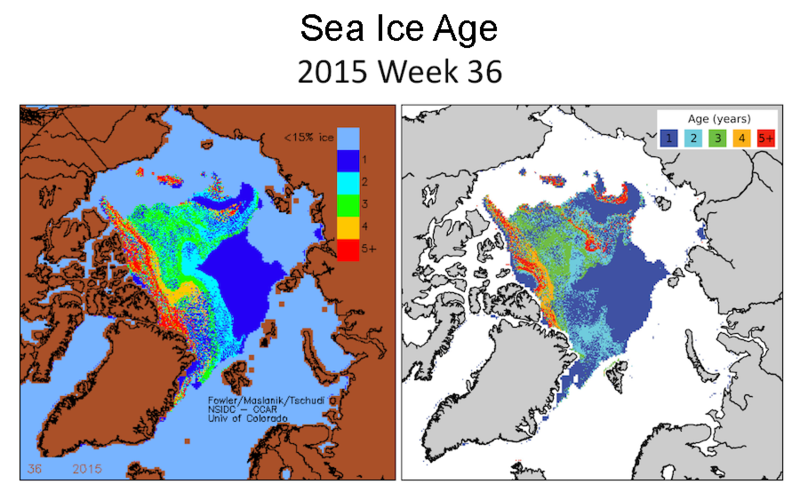 Let’s assume that a “complete loss of sea ice” does occur at some September minimum. Well, the difference in area between September’s AVERAGE sea ice minimum of 3.0 Mkm^2 and 0.0 Mkm^2 is .. well, 3.0 Mkm^2. So we lost “one Greenland”s ” worth of sea ice. Not the entire Arctic Ocean’s worth of sea ice by any means. Further, we lost that sea ice between its “normal” sea ice edge latitude of 80 degrees north! There’s not much sun at 80 degrees north in September 1- September 30. And every day after 12 August, every hour after 1 September there is even less sunlight every day. And, every hour of every day after 1 September, there is even less sunlight, striking at an even lower angle above the horizon, and striking through an ever-longer, ever-thicker atmospheric attenuation blanket. So, even IF the entire arctic ocean were “ice free” on September 15, it would be receiving very little solar energy, the melt ponds would have been refreezing for 4-6 weeks already, the snow on top of the sea ice would be building up, and the sun would be underground for more and more hours every day after the sea ice minimum was reached. So what? if all of the arctic sea ice melted one September, the Arctic ocean would lose more heat energy from the exposed ocean water than it would gain from the sunlight into that exposed ocean water. Now, if “all of the arctic sea ice were lost earlier” – say by 1 August somehow, when the sun is higher in the sky for more hours of the day than it is in mid-September? If so, the question becomes: What happens next? Well, by 1 September, the increased losses from increased evaporation, convection, conduction and LW radiation losses STILL mean 1 September will mark a time when heat losses exceed heat gains from solar radiation into the newly exposed ocean water. The sea ice melt ponds will continue refreezing each night – just like they did on 12 August when Judith Curry was observing them at 79 north. And so, the minimum sea ice point comes a little bit earlier that year (due to the increased losses of ocean surface heat) and the sea ice looks the same in October as it did the previous October. So, more sea ice loss between 1 September and 30 March = more heat loss to space through evaporation, convection, and conduction and radiation! So, even IF the entire arctic sea ice vanishes in September one year, there is no effect the following months, years, or decades on the arctic. Over the winter, regardless of how much sea ice is present in September, the arctic ocean will refreeze. A claim that the next five years of multi-year ice is “gone” can be made, but there is no evidence that that event has any effect. Most multi-year ice vanished in 2007, and the sea ice recovered. Most of the multi-year ice melted in 2012, and the sea ice recovered. In fact it increased in area – and area is the thing that counts in reflecting solar energy from the sea ice or from the ocean water. A fine reply you made,but I was pointing out that there are evidence from several published papers that it has been nearly or all ice free during the Summer earlier in the Holocene. I agree that temperature alone could not have made most or all of the ice dissipate during the “melting” season. Only they haven’t gotten terribly far. Well the forecast was right, wind calmed and changed direction. Dennis’s Birthday started off at 9 am. Bunting up, card signed, cake baked, vodka opened. Phew ! S dnem rozdenija Which is Russian for Happy Birthday. The ladies have had weeks to plan. Present of a tube map of London, a card, which looks like one I had when I was six, and a very nice red Mulberry leather note book – VERY NICE. I’m sure they bought it for me, but got mixed up. So the lunch was boozy, It was Dennis’s washing up day, but as it was his birthday, the ladies voted I should do it for him, and then tried to use every utensil on the boat. After a new siesta time, we are at dinner. Vodka time started at 6. They slug the vodka down in one, then they eat pickles, onions, cheese and biscuits. Next course is Blinis with Caviar and more vodka. Next course, hard boiled eggs , onions and vodka. After boiled potatoes and Herring from Murmansk and vodka. Then a specially baked Coffee and Walnut Birthday cake made by Ros, with vodka. Even if we had clear waters, I think we are here for the night. One thing’s for sure, we are running out of Vodka, so we must be getting close to sailing! Not peanut butter banana smoothies? Well, enough vodka makes any day just slip on by. Nights too. I am sure that if one hurries, they can still ride out of port tomorrow on a Northwest passageway cruise. Also the polar ocean challenge boat is stuck, their prognosis is not looking good. Currently waiting on ice maps. Afraid not, you have the wrong passage, Nordenskiöld transited the NE Passage, and required two seasons to complete the voyage having being iced up for the winter. In contrast, Ousland successfully transited both the NE and NW Passages in a single season a few years ago. There was certainly not less ice in the NW Passage in the late 1800s, it took Amundsen 3 years to make the journey in 1903-1906, whereas the route is open every year these days. They have left their anchorage and are en route to the entrance of the Vilkitsky strait now. Interesting take, Phil, that ‘en route’ phrase; must mean ‘stuck waiting and hoping’ in CAGW terms. Well, two good bits of news today. One is our permit came through from Vladivostock to be able to sail directly to Point Barrow. This is good news for a lot of reasons. One of them its the shortest direct route. Also, after talking to Sergai, after breakfast, he thought we should get a day or two of southerly winds. so if we are lucky, it could move the ice from the land, and let us sneak through. But we need to get closer to take advantage if it does happen. So stowed the tender and cleared the decks and tied everything down in the saloon and we are off. Three people down with sea sickness, but in the past it’s short lived and they are up and running after a stomach churning ! I am very lucky, – SO FAR , I don’t get sea sick, but hearing someone else makes my head consider it, so If it arises with someone next to me, I stick with my fingers in my ears and look the other way !!! So slowly making our way north east. With three people down it’s going to be a long night. The boat is moving to ‘be in a position’ to take advantage of the ice getting blown away from the shore’! Only as David puts it, luck, time and winds will tell if they can actually be ‘en route’ soon; even then, for just how long? Yup, the Southern route is so clear of ice… Not! There are sections where the ice coverage might allow a giant cruise ship and their attending ice breakers to smash through. I don’t know what you’re looking at, it looks fairly clear to me. About 250km (as the crow flies) since leaving harbor. Well there’s about 250km of ice to get through to reach the Laptev sea and they’re still about a week ahead of Ousland’s successful voyage. Ousland encountered ice at about the same location in the Laptev and was able to sail through it. “This is the Expedition Report from the “Northern Passage”. It is the 19th of August and we are now at 75°N, 122 °E, and that means we are headed eastward in the Laptev Sea. “…So we left the cape. We were desperate for new Ice charts. We got them, they showed us we could sail up past Chelyuskin in open sea !! but then the Laptev sea was still blocked for us. BUT we were on a roll, we tried to get as far as we could, but the ice was so thick , you could have skied faster. So, we had to retrace our route. We are now anchored by the shore against some fast ice. So tomorrow the weather forecast is winds from the South, that should take the ice away from the land. We can then move down the coast, and hopefully make our way East. They’re waiting for the vagaries of weather to assist them. A giant cruise ship virtually unequipped for ice wouldn’t dare. They’d have to let the ice breaker clear a path. And the oh so hot Arctic temperatures are already beginning the winter drop back below freezing. Gonna be chilly for those cruise ship passengers and Northabout sailors. Oh, and Northabout has just reached the Arctic ice. They better hope for some really strong winds. Yes, it is ONLY going to be second or third behind 2012 in extent. this is good news how? this means it is all going to be OK why? this is somehow showing temps are dropping? Come on!! I mean really!!! You sound like you are going to have a breakdown, over melting ice. Pretty clear form all the evidence that unless there is a massive reversal in the trend there wont be much summer ice left in the next few years, but hey what possible harm could that do? ..Yes Toni and Griff, what harm would it do if the Arctic melted ?? There could be trouble in Griff’s [trimmed]. Mark, I linked you to a set of data covering ice levels from all available records from 1850 to the present. Do you agree? Because that’s factually wrong. They’re just cherry-picking the time frame that supports the climate alarmists’ belief / contention / narrative / scare. That’s confirmation bias; a logical fallacy. 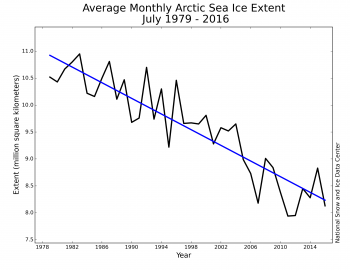 …the ice that typically covers the North Pole and surrounding areas of the Arctic has declined drastically. Were those measurements “anecdotal”? Or were they written records of their measurements? Answer: Those records were much more than “anecdotal accounts”. The measurements made centuries ago were used to create charts that are still in use today, because those charts are still accurate. “Where is all the ice?” a NASA project manager named John Woods asked. In your opinion, Griff, are the records of prior centuries accurate, or not? No cherry-picking, please. You can’t have it both ways. We also know that the Northwest Passage, the perilous, ice-choked route from the Atlantic to the Pacific through Northern Canada, is navigable today. But that doesn’t withstand scrutiny, since we also know that six to seven millennia ago the Arctic was very likely ice free in summer, and probably other times of the year as well. So the NW Passage would have been even more navigable than now, and that was before human emissions could have been a factor. If you want to use the “record”, you need to use the entire record, not just cherry-pick the part that confirms your bias. So, is there ‘danger’ from the ‘vanishing Arctic ice’ scenario? …the steady retreat of sea ice may have a residual effect on all sorts of other things, like the ice covering Greenland or storms in New England. Marika Holland, a senior scientist at the National Center for Atmospheric Research in Boulder… remarked that there’s no indication, with global CO2 levels and temperatures steadily rising, that we will somehow buck the direction of the trend. Actually, there is plenty of evidence that rising CO2 has no effect whatever on polar ice. And since there was no global warming over most of the last twenty years, what does Marika base her conclusions on? See the problem, Griff? The Arctic ice scare, like all the other climate false alarms is based on computer models, not on real world observations. Marika Holland is trying to convince the public that CO2 affects only one hemisphere—the hemisphere that supports her models. Maybe the public believes that model witchcraft, but readers here are more intelligent and better educated in the hard sciences than the general public. So if you want to be convincing, you will have to argue based on observations and verified, data-based measurements—which show that what we’re observing now is neither unusual, nor unprecedented. What we’re observing now has happened before, repeatedly, and to a much greater degree. And there is no convincing evidence that this time is any different. A negative PNA Pattern has been the favored mode all summer(as mentioned). Dunno, I can make a model, and some predictions of what 2100 will be like. According to NSIDC the average NH anomaly for July is -1.5 million sq km and the SH anomaly is -0.3 million sq km. Both show a drop (i.e. more negative) relative to last year. Yes in an El Nino 2015. yet SH has been on the up until that point, NH has just seen most snowfall in 2 decades with La nina, cant really consider this year, sure Greenland now well below normal temps. What makes you think the others are any better? La Nina is really hitting now. Couple that with the prog I made (and has since come true) that the loss would be mostly in the lower longitudes (Prime Meridian + / – some zone). Funny how hot and bothered Warmists get over a little melted ice. I guess it gives them something to hand-wring about, since overall temps don’t seem to be following the script. The problem is we get sucked into arguing about ice, but only because of the shrill claims about no ice and doom. what non-CAGW reason could there be for that? what reason can there be for the current levels, much lower (and continuing lower for nearly a decade) than the last cycle? Meanwhile the snows are way up, since 2010 cold has been surging. Records falling like dominoes. Smashing any counter warming hysteria. Greenland summit broke it’s July cold by a few degrees, Finland recently broke it;’s coldest twice in one year. 10s of thousands of alpacas dead, climbers frozen to death in the alps where there is meant to be no snow by now, US cold records falling by the thousands since 2010. While there is hysteria over a massively estimated .2 .3 or .4c warming anomalies. R to the O to the F to the L.
If we had balance, cold doom would be far more prevalent in the media. Getting close to the minimum now. A few more weeks and we’ll hit inflection.